Stena Line's HSS vessel, the Stena Explorer, which operated on the Holyhead - Dun Laoghaire route between 1996 - 2014, is about to make her last journey on the Irish Sea as she makes her way to new owners and based in Turkey. The Stena Explorer was first introduced in the middle of the '90s when the vessel and her sister vessels Stena Voyager and Stena Discovery were unique in their class. Since her first sailing almost 20 years ago in April 1996, the first HSS to take up service, the Stena Explorer has carried over 15 million passengers, 3 million cars and over half a million freight units on almost 29, 000 sailings between Britain and Ireland. The ship’s last commercial journey for Stena Line on the Irish Sea was in September 2014. When commissioned by Stena Line, the HSS series of three ships, including the Stena Explorer, helped to revolutionise the look of the ferry industry. With its top speed of 40 knots and high quality onboard travel experience for 1,500 passengers and car capacity of over 600 vehicles, the ferry became an instant hit with customers. The Stena Voyager and her two sister vessels were designed by another company in the Stena Sphere Group, Stena Teknik and at the time were one of the most revolutionary designed and constructed ships in the world. Ian Davies, Stena Line’s Route Manager (Irish Sea South) said: "Whilst the HSS class was a unique and highly innovative development for Stena Line at the time, the market has evolved significantly since her introduction in the mid 1990’s and today’s business model requires a more balanced mix of freight and car traffic all year round. 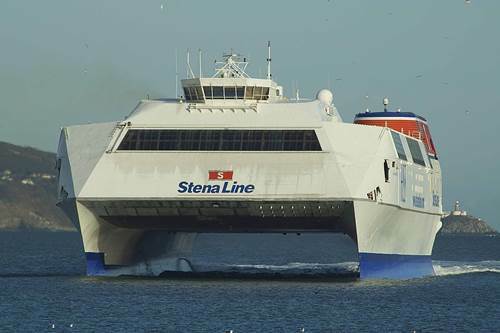 Captain Andrew Humphreys, Stena Line’s Safety Manager for the UK had the honour of bringing the vessel into Holyhead on Feb 6th, 1996 and can recall the event vividly. Captain Humphreys said: “I can remember everything about that special day. Holyhead, a port used to virtually every shape and size of vessel had never seen anything like it. The current schedule, weather permitting, is for the Stena Explorer to leave Holyhead tomorrow escorted by tugs on her journey to Turkey.